Our colleagues in Spend Matters US released today the Q1 2018 SolutionMap, ranking 40 procurement technology providers across nine different solution categories — including an end-to-end view of Source-to-Pay (S2P) providers and their capabilities for the very first time. 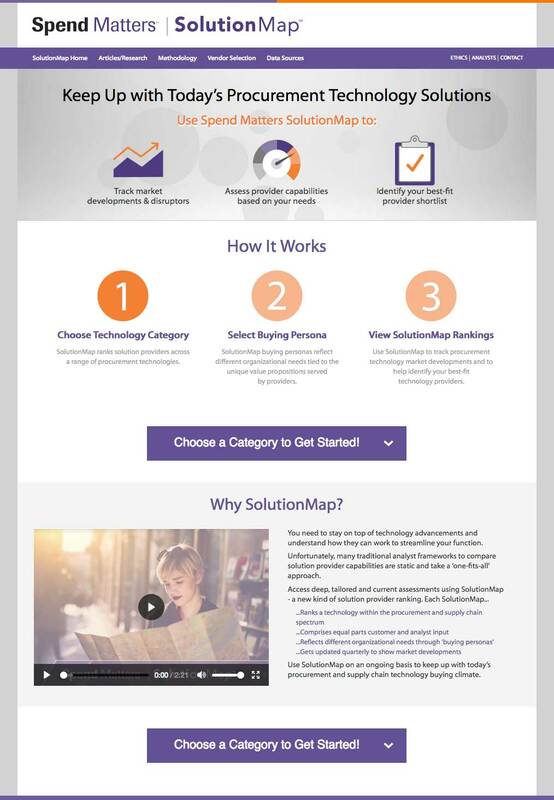 Begin exploring provider rankings now for free — visit the SolutionMap homepage. New providers have been added, such as Oracle, OpusCapita, SynerTrade and Yooz. For full access to the list of all participating providers, their scoring summaries and more, learn how to become a SolutionMap Insider. Q1 2018 marks the first release for a Source-to-Pay SolutionMap “view,” which includes updated analyst scoring and new customer reference data for some of the providers participating in this inaugural suite view. You’ll also be able to learn about each solution category and persona definition in detail, as well as read up on the Spend Matters analyst team’s methodology, before seeing how this quarter’s participating providers performed across nine different technology solution categories.